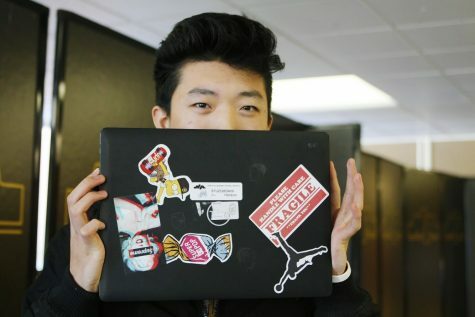 Many students adorn their laptops with stickers, but rarely are these decorative choices looked at twice. We are intrigued as to what these laptop stickers have to say about their owners, so we got 4 students to give their take on the blank canvas that is a Dell computer. In a large high school like NA, where it is not difficult to disappear into crowded hallways of people, many students strive to find ways to set themselves apart from the rest. When looking around a class of NAI, a sea of stickers masquerading the school distributed laptops can be seen. Whether it be through a favorite musician, college, or quote, Supreme and Vans, or merely a random sticker that the student thought would be the perfect space filler, NAI has found a method of transforming something that was once pitch black into a screen that is erupting with color, personalized only to them. Similar to the style that students choose to dress in and the music taste they possess, the common general theme of the decals that the freshmen and sophomores choose to display on their computers say something about that particular individual. What do your laptop stickers say about you? After the profiles on NAI’s stickers, scroll down to find out. 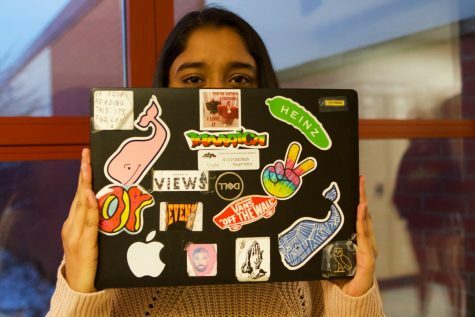 An array of color and common themes, Samhita has stickers of all sizes and colors filling up space on her computer. Some of the decals feature favorite music and movies or tv shows of hers, including Cher from Clueless, Friends, and Cage the Elephant, a band that she loves. The tenth grader told us that she used to “stick to a color scheme, but now [she] likes it kind of funny”. Naturally, the sticker that catches most everyone’s eye is Peppa Pig. “The Peppa pig one was from my friend Maggie, and I thought it was funny because it doesn’t go with any of the other ones,” Samhita explained. Despite this, she chose the Supreme Kermit sticker, as she feels that “It’s funny because sometimes people just don’t get it”. Supritha sports a collection of her signature favorites that many will notice her wearing, using, or listening to. Included in the assemblage, Challa has stickers of Drake, Vineyard Vines, Vans, an Apple logo, and one Heinz Pickle. As to which one is both her favorite and represents her the most, Challa chose the various heads of Drake. “Drake is my favorite rapper of all time, and is a literal legend,” Challa explained in defense of her choice. When asked what prompted her to choose her specific stickers to cover her laptop with, Réka told us what captivated her about the three stickers that she has used. The rebellion sticker, “was brought back from Berlin by my dad, and I thought that it was funny because it was a bad translation and obviously doesn’t make sense.” She bought the other two stickers later because they caught her eye. Which one represents her the most? Réka told that she thought the rebellion misprint just embodied her personality.